Bona Mix and Fill water-based joint filler is an excellent product that is designed to fill the gaps between floor boards which, in turn, makes them draught-free and also dramatically improves the insulation in the room. It’s designed to fill gaps up to 2 mm across and also repair any minor defects found. 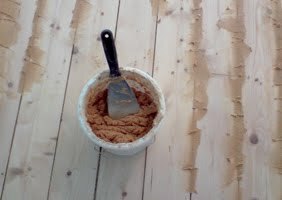 It is mixed into a paste-like substance with the fine clean saw dust collected from the sanding machine (when using the 80 grit belt) then applied between the gaps in the floor boards. Once dried it can be sanded down with an 80 then 120 grit belt filling the gaps to perfection and, as you’ve used your own saw dust, it should also make a good colour match as well. 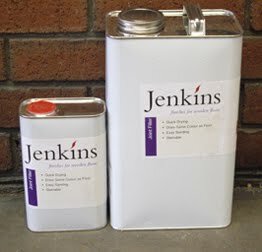 Jenkins Solvent based Joint filler is an excellent product that is designed to fill the gaps between floor boards which, in turn, makes them draught-free and also dramatically improves the insulation in the room. It’s designed to fill gaps up to 5 mm across and also repair any minor defects found. 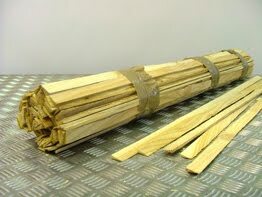 We can supply packs of reclaimed pine slivers strips.They totally seal the gaps between the floorboords and as they are cut into a triangle shape they will fill a gap upto 8mm across. They will insulate the floor stopping any draughts and save money on heating and will take stains, oil or lacquer finishes. Step 1: Secure any loose floorboards and punch nail heads down 3–4mm. Clean between the gaps, be careful of any wiring or pipes. Step 2: Offer a sliver into gap to see how it sits. Remove it and run a line of our sliver glue down each side of the sliver. Step 3: Hammer down the sliver down the whole length of it the tighter the fit the better. Step 4: Run a sharp chisel along the length leveling the sliver flush to original floorboard height. Step 6: Clean up the floor and start the floor sanding process.